There are a handful of hot button issues surrounding Lyme disease that are sure to ignite a firestorm of debate within the medical community; among them is the duration of time required to effectively treat the disease. Since this study is all-inclusive and not restricted by patients passing the two-tier test, it offers a unique insight into actual treatment practices and is more representative of the patient population afflicted with Lyme disease. According to the study, 18% of Lyme disease patients were treated for more than 5 weeks (defined as extended therapy by the authors). The actual length of time patients were prescribed antibiotics was much longer with an average of 86 days. Treatment duration ranged from 35 to 404 days. 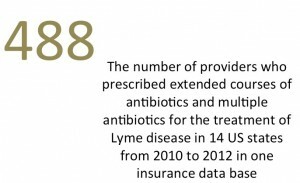 Nearly half of Lyme disease patients (48.8%) were treated with more than 2 antibiotics. Doxycycline was prescribed in as many as 74.4% of LD patients. Azithromycin was prescribed in as many as 11.5% of LD patients. Amoxicillin and cefuroxime were also prescribed. The study did not look at additional antibiotics, such as minocycline and tetracycline, typically prescribed to treat other tick-borne illnesses. The use of extended therapy also involved switching from one antibiotic to another and/or combinations of antibiotics. The study found, 43% of patients were switched from one antibiotic to another, while 18% were prescribed combinations of antibiotics. It was not a surprise that a small group of doctors prescribed extended therapy for a significant number of Lyme disease patients. These 16 doctors (3%) treated more than 20% of the Lyme disease patients, who were prescribed extended antibiotic treatment. However, the findings that hundreds of other providers, listed in a single insurance database in the Northeastern U.S., prescribed extended antibiotics was surprising. 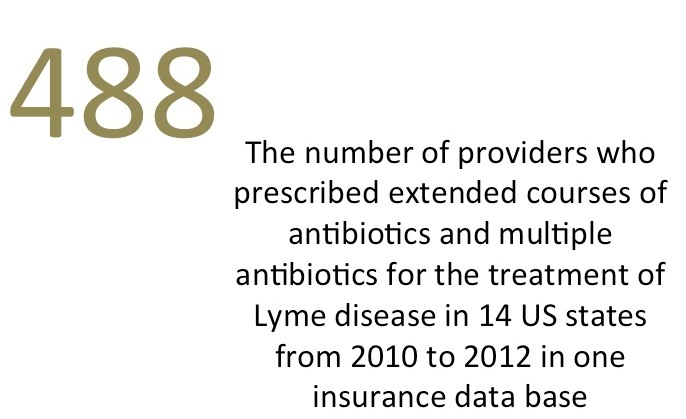 In other words, 472 doctors treated the remaining 80% of Lyme disease patients with extended therapy. It was also surprising to find that those 16 doctors actually did not differ from their 472 peers in prescribing extended courses of antibiotics. However, the prescribing patterns did differ between the 16 doctors, who treated more than 20% of the Lyme disease patients, and their 472 colleagues, when measuring the average number of antibiotic exposure days, the number of refills in the longest drug era, and the combination of antibiotics prescribed. In addition, the authors did not mention that there are, in fact, doctors who have recommended extended antibiotic therapy for select patients based on a risk-benefit assessment and shared medical decision. The following excerpt from the International Lyme and Associated Diseases Society (ILADS) evidence based guidelines describes the risk–benefit assessment needed when making a shared medical decision. 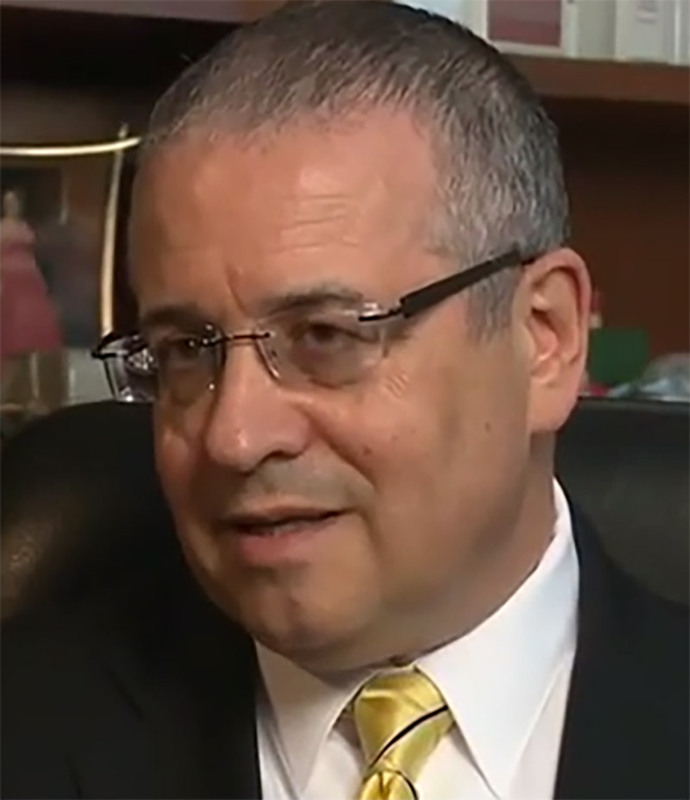 Medical societies continue to debate the optimal treatment regimen. In the mean time, doctors have to use clinical judgment when treating their Lyme disease patients. The paper demonstrates that hundreds of doctors are choosing extended antibiotic therapy in an effort to successfully treat their patients. Tseng YJ, Cami A, Goldmann DA, DeMaria A, Jr., Mandl KD. Incidence and Patterns of Extended-Course Antibiotic Therapy in Patients Evaluated for Lyme Disease. Clin Infect Dis, (2015). Molins CR, Ashton LV, Wormser GP et al. Development of a metabolic biosignature for detection of early Lyme disease. Clin Infect Dis, 60(12), 1767-1775 (2015). 4 Replies to "Hundreds of doctors treating Lyme disease with extended use and multiple antibiotics"
It is very exciting to see that more and more research seems to be taking place relating to Lyme disease diagnosis, complexity of symptoms, and range of treatment. Thank you for your consistent part in this. Good to see science slowly starting to win out. Refer to science adn evidence based ILADS guidelines. Good to see science slowly starting to win out. Refer to science and evidence based ILADS guidelines. 9-8-15, i met betty mahoney 1st time in white bear, minn. when i heard nc bart expert, dr. ed breischwedt, sp, speak! she got me to the meeting place since i’m from IOWA. thanks for my upper tonight; i posted it on lyme site i post in. THANKS FOR ALL YOU DO DANIEL and serving as ilads pres/past pres. i can’t keep up whose pres. now..neuro lyme of 46.5 yrs. MISDIAGNOSED 35 yrs. by 40-50 drs.